In Taiwan, traditional Chinese medicine (TCM) is closely connected with people’s daily life. In this regard, the China Medical University boasts solid experience and advantages to cater to the increasing needs for community and personalized medicine. China Medical University is Taiwan’s earliest tertiary institution devoted to the study of traditional Chinese medicine. It possesses the strongest and most complete teaching and research teams, ranking first among domestic medical universities in terms of the research achievements in TCM and also ranking in the Top 10 in the world. In the face of the uprising trend of evidence-based medicine and rapid social changes, the University established the TCM and Acupuncture Research Center to further enhance the innovation and R&D level of TCM. The office of the Center locates on the 11th floor of Lifu Medical Building, and is headed by Director Chang Hen-Hong. The Center consists of 3 teams: administrative team, research team and research cluster. The administrative team is responsible for coordinating all the administration affairs; the research team is composed of University teachers and physicians of the affiliated hospital, who conduct various researches in accordance with the development strategies of the Center; the members of the research cluster are those teachers in the University who are passionate about TCM and acupuncture. In addition, with the support of the University, the Center has completed the renovation of the core laboratory, which becomes the basic translational research, cooperation and service platform. 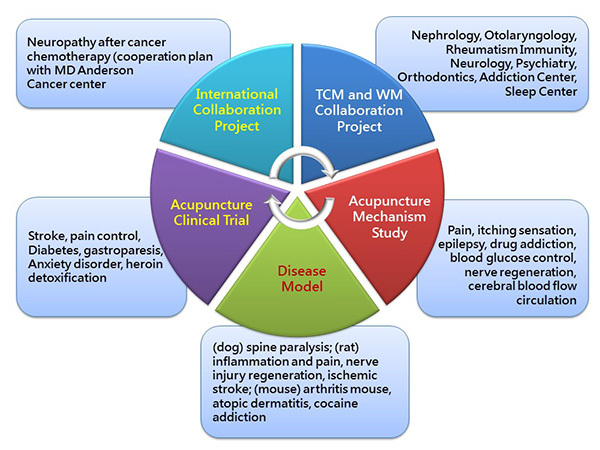 The Center has 5 developmental objectives, which are: engaging in the basic and clinical research of TCM and acupuncture; integrating the research resources of TCM and acupuncture with clinical teaching development; spreading the education and training of TCM and acupuncture; promoting inter-department and inter-disciplinary research; enhancing the cooperation and exchanges with other domestic and overseas universities; and providing related consultation and suggestions to government and institutions on TCM and acupuncture. In terms of development strategy, the present study of the Center focuses on the “neuroscience research of acupuncture”, which is divided into 2 research clusters: basic and clinical. The basic research team is headed by associate professor Lin Yi-Wen, while the clinical team is led by associate professor Sun Mao-Feng. The Center is also strengthening the cooperation with the various disciplines of western medicine, drawing on their strength (of modern technology) and promoting the modernization of TCM. It fosters and cultivates qualified, innovative and talented personnel that meet the needs of the society, and forms the inter-disciplinary team that centers on the patients to carry out innovative medical research. In the future, besides continuing the existing research on acupuncture, the Center will also carry out researches on other aspects of TCM to fulfill the objectives of the Center and enhance the research level of TCM and acupuncture at the same time. Furthermore, it will also boost the cooperation with other 4 university-level centers to apply the related knowledge of TCM and acupuncture to modern medical field and strengthen the knowledge integration between Chinese medicine and western medicine. The Center will cooperate with the government’s biotech medicine development strategy and conduct opinions communication and knowledge integration among industry, government, academia and research institutions. It is hoped that the overall level of TCM will be enhanced under the joint efforts, and that more TCM talents will be cultivated, so that Taiwan will play a key role in leading the world in developing traditional medicine and alternative medicine.